What kind of service is "TOKYO FREE Wi-Fi"? "It's a public wireless LAN (Wi-Fi) service in Metropolitan facilities that tourists often visit. This service can be used by tourists free of charge. Registering with one free Wi-Fi service gives you access to all partner free Wi-Fi services., and you can also use Japan Connected-free Wi-Fi Apps with it. Once you download the Japan Connected-free Wi-Fi App, besides using its original services, you can also connect with it at certain facilities such as airports and convenience stores. Do I have to pay to use this service? No, you can use it free of charge. Do I have to register to use the service? Yes, you have to register an e-mail address or SNS account in order to use the service. Can I use the service with a PC or a tablet? Also, can I use the service with game consoles and feature phones? You can use the service with PCs and tablets. Some game consoles and feature phones might be able to use the service if they have a Web browser built into them, but we cannot fully guarantee operation with these devices. Are there any time limits when using the service? No, there are no limits on the amount of time that you can use the service. It is available 24 hours a day and 365 days a year. However, all registered information that you provided will be reset after two weeks. How many languages is the service offered in? The service is offered in the following four languages (with two types of Chinese language offered). How do I know exactly where I can use the service inside the applicable parks and facilities? There are some Wi-Fi access points at certain locations in parks and establishments that are easy for tourists to see and gather at. You can use the service at places in which you can see the following sticker. I see a message that says "TOKYO FREE Wi-Fi SSID cannot be found in my network list". Check around your location for one of the stickers to make sure you are in one of the Wi-Fi zones. The SSID will not be displayed if you are outside the Wi-Fi zone's range. If the SSID doesn't show up even if you are within the Wi-Fi zone, then it is possible that your device is not properly receiving the signal. Try turning the Wi-Fi off on your device, and then turning it on again. This might help to solve the problem. ※ This advice depends on the type of device you are using. While I'm connected to the internet, the TOKYO FREE Wi-Fi site is automatically being displayed. If you have Wi-Fi set to "ON" on your device, then the device will receive our signal and automatically display the Wi-Fi portal site. If you do not want to connect to the site, turn off your device's Wi-Fi settings or uncheck the option to automatically connect to "TOKYO FREE Wi-Fi"
Can I use the internet immediately after I connect to Wi-Fi? No. In order to use the internet, you need to complete user registration after connecting to the Wi-Fi. I registered my e-mail address, but I haven't received an e-mail. Please confirm if your e-mail address was properly registered. If you have a junkmail filter, change the settings so that e-mails from @wifi-tokyo.jp. do not show up as junkmail. The internet is not available. I'm not sure that I can register using e-mail. While registering, you will be able to temporarily connect to the internet in order to complete registration, so you should be able to send and receive e-mail during this time. After 10 minutes have passed, the URL for the registration will expire and your internet connection will disconnect. If you were unable to complete registration during that time, please start the registration process again from the beginning. Which SNS can I use to complete registration? You can use your account with the following services. If I use my SNS account for registration, I'm afraid that the action of registration will be displayed in my time line or posted to my SNS account somehow. No actions will be displayed on or posted to your time line. Are there any web sites that cannot be viewed or smartphone apps that cannot be used? In "TOKYO FREE Wi-Fi", there is a filter function employed to protect youth from harmful internet material, so there are some web sites that cannot be viewed. Similarly, some smartphone apps used for communicating on the internet may be subject to filtering. This service is for everyone, including children, and we want to make sure that everyone can use the internet safely, so we appreciate your understanding on this matter. In addition, please understand that it is not possible to cope with personal requests, such as deactivating the filter for individual people. I'm afraid that my personal information and browsing information could be leaked by utilizing the Wi-Fi. However, in order to make use of the service simple and effective, it was not built to be compatible with certain security services that are utilized by wireless LAN devices, such as WEP. If there are users with malicious intent, they might be able to intercept communicated information from the wireless signals (signals being sent from the device to the access point), thus there is a possibility that your personal information, including entered IDs, passwords or credit card numbers, could be stolen. Therefore, please note that you are solely responsible for your own actions when you use this service. We do not accept responsibility for any data that may be stolen from you while using this service. If you need service that requires security, it is recommended that you use paid public wireless LAN services. My device has already been connected to the TOKYO FREE Wi-Fi SSID, but I still can't connect to the internet. Even if your device is catching the signals, you might not be able to successfully connect to the internet due to weak signals in cases when there are obstacles blocking the signal, or when many people are using the service at the same time. Try again after changing your location, or try at another time. If that doesn't work, please contact the call center. The connection speed is slow. We offer the best service that we can provide, but we cannot guarantee the quality of the service, including connection speeds. Please understand that the connection speed can slow down for a variety of reasons, including connection locations, congestion, the state of your device and the status of the web site that you are browsing. A problem occurred during use. Who should I contact? Please contact the call center for this service. ※ This service may be unavailable depending upon your phone service provider. ※ If you contact us by e-mail, there may be a delay in our response time. Is it possible to use multiple devices at the same time using the same e-mail address or SNS account? Separate registration is required for each device, but it is possible to use them at the same time. When I stop using TOKYO FREE Wi-Fi's Wi-Fi, but later I want to connect to "TOKYO FREE Wi-Fi" again, will I need to register again? 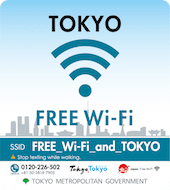 When you try to reconnect within 24 hours, after connecting to Wi-Fi, you should be able to immediately use the internet.When you try to connect after the following day, the "TOKYO FREE Wi-Fi" page will be displayed. However, you should be able to use the service for two weeks after registration, without having to re-register. Where can I use partner free Wi-Fi services? Please tell me about the terms and conditions and usage procedures of partner free Wi-Fi services and "TOKYO FREE Wi-Fi". Are they all the same? No, each service is different. About the connection between us and our affiliated Wi-Fi services, please check the page below. I can't connect to the internet using the Japan Connected-free Wi-Fi. If you cannot connect directly from the app, try connecting from the Web browser, which might work. If you have problems with other apps, please contact the individual app's developer. If I download the Japan Connected-free Wi-Fi app, where can I use the service? Please check the Japan Connected-free Wi-Fi site or use the "Search" tab in the app. ※This service may be unavailable depending upon your phone service provider.